Stalin was in Baku in the early 1900s where he was involved in rallying the oil workers to strike against the oil field owners. In fact, during those years he was even jailed in Bayil Prison in Baku. 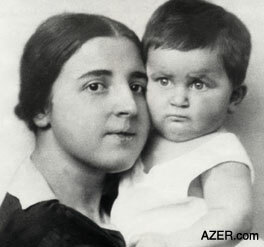 Left: Stalin's second wife, Nadezhda Alliluyeva with daughter Svetlana, 1927. Nadezhda committed suicide in 1932 at age 31. In addition, there is a family link according to his daughter Svetlana, who later tried to distance herself from her father and eventually caused a furor by defecting to the United States (1967). Svetlana's mother committed suicide (1932) when she realized that Stalin was not the man she thought she married, and she realized that he would never give her a divorce. "My father had known the Alliluyevs for a long time, since the end of the 1890s. He loved and respected them both, and they felt the same way toward him. In his reminiscences my grandfather has dealt at length with their early meetings, which had to do with the underground workers' circles." "There is a family legend that as a young man my father rescued my mother [Nadezhda] from drowning. It happened in Baku when she was two years old. She was playing on the shore and fell in. He is said to have gone in after her and fished her out. Years later my mother met my father again. She was a schoolgirl of 16 by that time, and he an old friend of the family, a 38-year-old revolutionary, just back from exile in Siberia. Maybe the fact that he had rescued her seemed significant to her, for she was a romantic - full of feeling and imagination." From "Twenty Letters to a Friend" by Svetlana Alliluyeva, (Stalin's daughter). Harper & Row: New York, 1967, p. 47.